September's birthstone is the gorgeous sapphire -- as a December baby, it's the one that I secretly covet, because it's just so rich and beautiful. Since I can't have a September birthstone, I'll console myself with a cavalcade of royal sapphire tiaras. This is a list of my top ten favorites -- be sure to chime in with your own list below! 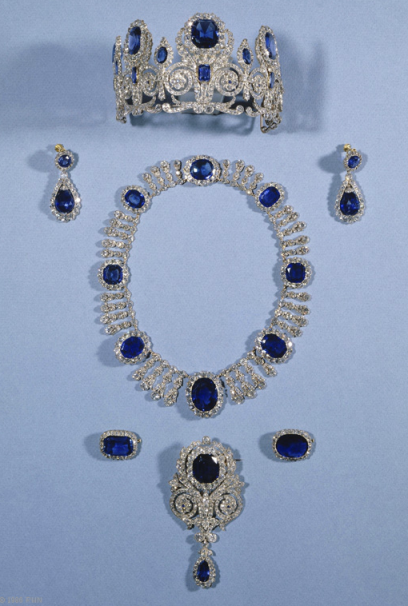 Originally a necklace worn by a Belgian princess, this pieces was acquired by Queen Elizabeth II of the United Kingdom to match the sapphires given to her by her father. She set it on a tiara frame, and for years, it was one of her most-worn pieces. If you can't have the ill-fated Cambridge sapphires, I suppose this is the next best thing? Princess Caroline of Monaco selected this necklace/tiara conversion for her brother Albert's wedding reception in 2011. It's on the simple side as convertible tiaras go, but I really kind of love it, especially as a sort of petite version of a traditional kokoshnik. Made by cobbling together a necklace from the family's sapphire parure with extra bits from Queen Wilhelmine's wedding gift parure, this tiara gives the Dutch royal family an easier-to-wear sapphire alternative to their big-gun sapphire diadem. It still manages to be classic and elegant on wearers like Queen Maxima and Princess Margriet. This little sapphire and diamond tiara was designed for Queen Victoria by Prince Albert in the early years of their marriage. 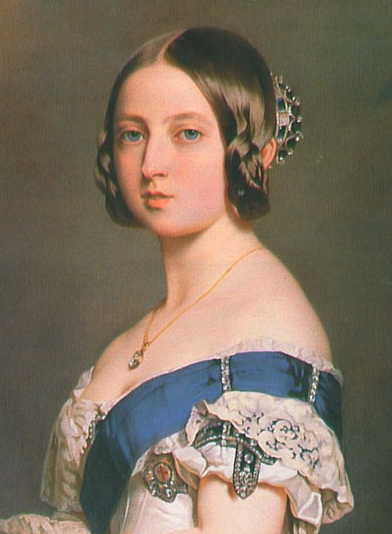 Winterhalter immortalized it in a portrait of the young Victoria. It eventually found its way into the collection of the Lascelles family, the descendants of Victoria's great-granddaughter, Princess Mary. They still own it today, and you'll occasionally see it make an appearance on a family bride. 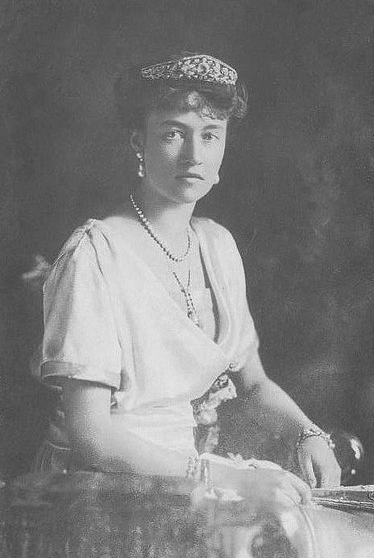 The grand ducal family of Luxembourg's jewelry vault is so extensive that it actually contains multiple sapphire pieces that can be worn as tiaras, but my favorite among them is the heirloom tiara that features a single gorgeous sapphire nestled among diamond leaves. Lately, this one has become a favorite of Hereditary Grand Duchess Stephanie as well -- she's worn it at a few events in recent years, including this year's National Day gala. An absolute masterpiece of Cartier design, this diamond, pearl, and sapphire tiara was made for Princess Marie Louise, one of Queen Victoria's granddaughters. The design was inspired by Indian art and architecture, and the final result is rather weighty and imposing, but the tiara's current wearer, the Duchess of Gloucester, manages to pull it off elegantly. Speaking of imposing tiaras, here's a big one: the diamond, pearl, and sapphire tiara made for the wife of the 6th Duke of Portland. The magnificent piece dates to extravagant end of the nineteenth century, and its sheer size makes it a major challenge for a wearer. 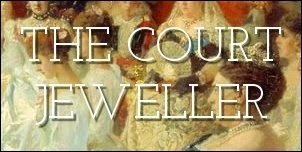 The family sold the tiara in 2010, and I still live in hope that it was purchased by the Prince of Wales for the one woman who could do it justice: the Duchess of Cornwall. This is only one of two magnificent sapphire sparklers owned by Queen Marie-Amélie, wife of King Louis Philippe I of the French. It's my favorite of the two, in part because you can go visit it at the Louvre! The Orléans family managed to hold on to the piece until the 1980s, when they sold it to the museum. It's on display there now with the rest of the gorgeous pieces of the parure. With enormous sapphires perched atop a flexible wall of diamonds, the sapphire tiara in the Bernadotte vaults is a true classic of the art form. It also has an impressive legacy, with origins in the imperial court of Napoleonic France. It's one of Queen Silvia's favorites, and it's easy to see why! One of the biggest and most impressive royal sapphire tiaras around, the grand tiara from the Dutch sapphire parure was constructed in the nineteenth century. It's been worn by a number of Dutch queens over the past century, but it made one of its grandest appearances yet on Queen Maxima at the inauguration of her husband, King Willem-Alexander, in April 2013.